Last message hopefully, on Tithing. Question: I hear that you say tithing is not a requirement and we should not give it. I understand you but, I still want to voluntarily give to the church and my pastor. Can I do that? Well, will be answering that in this message. First of all the question should be, was there voluntary giving, not tithing, in the Old Testament? The answer is a big Yes! “ Speak to the people of Israel, that they take for me a contribution. From every man whose heart moves him you shall receive the contribution for me. That is not all the verses but this should suffice to show that over and above tithe(tax), there was voluntary giving. Who were the Jews voluntarily giving to? Well look at this verse and there are many others. 35 “If your brother becomes poor and cannot maintain himself with you, you shall support him as though he were a stranger and a sojourner, and he shall live with you. 36 Take no interest from him or profit, but fear your God, that your brother may live beside you. The word poor appears 174 times in the bible and this shows how serious God is about the poor. They were giving to the poor, not the pastor, since there were no pastors then, and only Aaron and his sons and Levites. So free giving was there in the Old Testament. What about the New Testament, is there free giving? Yes! In Luke above, Jesus says we must give and in the same manner that we give it will be given to us and more. Who must we give to? And all who believed were together and had all things in common. 45 And they were selling their possessions and belongings and distributing the proceeds to all, as any had need. There was not a needy person among them, for as many as were owners of lands or houses sold them and brought the proceeds of what was sold 35 and laid it at the apostles ‘feet, and it was distributed to each as any had need. Although in verse 35 above, the collection point was at the feet of the apostles, it was distributed to each as any had need. The apostles did not keep it to themselves and bought nice things for themselves and their wife’s and friends. The whole purpose of giving was and even to date should still be about giving to the poor, not to pastors and churches unless, they in turn give to the poor. 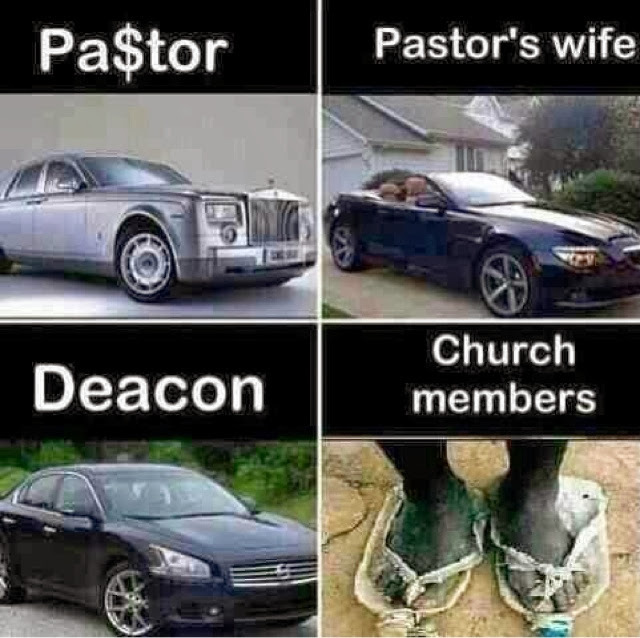 What is a point of an extremely rich pastor who became rich because of the congregation that is extremely poor? g4124. πλεονεξια pleonexia; from 4123; avarice, i. e. (by implication) fraudulency, extortion:— covetous (- ness) practices, greediness. How did the disciples give? Was it voluntary of forceful? For they gave according to their means, as I can testify, and beyond their means, of their own accord, 4 begging us earnestly for the favor of taking part in the relief of the saints — 5 and this, not as we expected, but they gave themselves first to the Lord and then by the will of God to us. Verse 4, they gave voluntarily (of their own accord) and according to their means. They also gave beyond their means out of their own accord(that is voluntarily) they literally begged Paul to give. They begged Paul to take part in the relief of saints(believers) just like them. Even Paul says that is not what they expected. They were not forced but, they begged to give. They knew that you cannot out give God, the more you give, the more he blesses you with more. You cannot give so much that God is unable to give you more than you have given. God is able to bless you abundantly( more than you need) in all things and at all times. You will have all that you need and you will continue in the good work. He will simply bless you plenty at all times in all that you need. You cannot out give him. Forget it! You give more, he gives even more. The disciples gave voluntarily to the poor. Some even begged to give. God says there was not a single person who needed anything. The bible also says that they were blessed so much by God that they needed nothing. If anyone says to you you MUST give because God has commanded us to give, he is a liar. Tithe ceased to exist when Jerusalem was conquered. Tithe was only payable by the Jews to the Jews elected by God. No where in the bible is it a requirement for Gentiles or Non Jews to pay tithe. Giving must be done voluntarily without hesitation, must be to the poor, must be according to our means and more if you so wish. There is no minimum requirement for giving and giving is definitely not ten percent of your salary. I have given you the information so that you may decide. The choice is ours what you want to do with it.